It takes more than aspiration to move into the world of consumer brand startups. Entrepreneurs who have created new and innovative products, whether within the food, apparel, lifestyle, personal care, cosmetic or tech sectors (among others) face a host of challenges. Every startup entrepreneur is therefore compelled to create a cogent and comprehensive business plan at the outset, and because “sh*t happens”, the startup leader needs to be prepared to make material changes within that playbook. The startup entrepreneur’s daily activity is inevitably touching the topics of startup’s brand name, manufacturing, product packaging, regulatory approvals, supply chain logistics, order fulfillment, marketing strategies, sales strategies, e-commerce and website maintenance, social media ploys, public relations, advertising, human resource management, legal, accounting and most important, making sure there is sufficient working capital to address the aforementioned hot button items. A startup’s evolution from nascent stage to securing real traction to fast growth to ultimately being acquired at a big multiple can occur over months or several years, but requires a heavy dose of aspiration and an even bigger dose of perspiration. The smart entrepreneur is an optimist; always hoping for the best, but also always planning for the worst. The team at Prospectus.com LLC has a long history of working with startup entrepreneurs within the consumer brand space. Every so often, a famous celebrity from the sports or entertainment world is referred to us to provide guidance within the context of business plan preparation, fine-tuning final proformas, modeling enterprise valuation scenarios, creating investor presentation decks, investor offering documents and objective, consultative guidance as to how to best raise outside capital. Of course, it is always inspiring when a famous celebrity reaches out to us for help and guidance, if only because it adds a feather to one’s cap in terms of showcasing representative clients. That said, working with a celebrity startup entrepreneur who is not “properly squared away” can prove to be a challenge that our seasoned startup consultants concluded just recently when one of Hollywood’s “A-list Celebs” came to us (via referral) with the task of preparing a comprehensive business plan for an organic cosmetic product startup that our celeb was seeking to raise capital for. The business plan that our celebrity startup entrepreneur wanted envisioned our building a model that would imply the startup has a $100 million enterprise valuation to justify her ‘ask’ of $10mil for 10%–which our celeb had just pitched to senior executive of a multi-billion asset management firm; one having a ‘sleeve’ that puts money into startup companies. The proposed project anticipated preparing an investor pitch deck, as well as putting together a private placement offering memorandum for accredited investors. It is fair to suggest that startups led by well-known celebrities generally have an advantage when bringing a new consumer product to market, simply because they’ve already established their brand and can easily leverage his/her brand to promote their new business model. That said, not every celebrity startup is destined for success; those who don’t read the crib notes above are assured to fail. This is precisely the message that was relayed to our very well known “Hollywood celebrity” whose modeling and acting career is filled with fame and glory, and whose even-more celebrity husband is one of the top 10 most known Hollywood actors of this generation (based on his Q rating and his having more trophies than Imelda Marcos had shoes). The premise for Celebrity Startup is simple: We know that “fashion land”, the specialty foods and the spirits world, multiple consumer product silos, and even the tech landscape are all populated with startups that have been launched and led by celebrities whose Q Scores aka “Q Rating” have served as the “wind-in-the-sail” that has propelled their respective innovative products (and/or services) from startup stage to multi-million companies, and in some cases, billion-dollar enterprises. Many of those celebs are smart business people and their creative talents have transcended into original ideas for compelling consumer market products and they either surrounded themselves with smart business folks to address crucial decisions, or they had the smarts to make the right decisions during each of stage of evolution. It is also true that more than a few celebs are really not so smart when it comes to launching and operating a real business. There is also those who have achieved celebrity status,but have absolutely no business pretending to be entrepreneurs delving into the world of startup businesses. That said, we also know that the number of celebs who have leveraged their professional sports stardom, their modeling fame, or respective stage and screen credits for purposes of building a consumer brand is a big number. Or, as former celebrity TV host-Donald Trump of “The Apprentice” and spin-off show “Celebrity Apprentice” fame would say “the number is HUGE!” and evidenced by a link to 17 top celebrity startup brands. 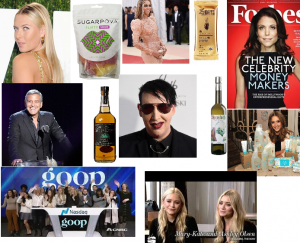 Notable “celeb-turned-startup entrepreneur” include among others, Jessica Alba (“Honest Beauty”), Gwyneth’s “GOOP”, actress Kate Hudson’s “Fabletics”, Bethenny Frankel’s “Skinny Girl”, the too-hard-to-count Kardashian consumer product lines, Clooney’s “Casamigos” spirits company, the Olsen Twins apparel line “The Row”, etc., etc., etc. And let’s not forget the Godfather of Celebrity Startups, Paul Newman, whose “Newman’s Own” line of food products were first cooked up in his Westport, CT garage (this writer was first hand observer!). Newman’s Own is a Harvard Business School case study in consumer product brands; the not-for-profit company’s broad range of food products are now ubiquitous across retail store shelves in every part of the US, and plenty of other places too. We also know of the many ‘celebrity-branded’ products that are otherwise not much different than other existing products easily found at many stores or online. The differentiation is the celebrity name on the label. Some celebs-turned-entrepreneurs have had wild success, others a modicum of success, while others consumer product initiatives started up by celebs have died on the vine. This entry was posted in Featured and tagged busines plan, celebrity consumer brands, celebrity startup, celebrity startups, consumer brand startups, enterprise valuation, offering memorandum, private placement, startup, startup consultants, the jlc group. Bookmark the permalink.